The Angriest: Doctor Who: "The Big Bang"
It is 26 June 2010, and time for the Season 5 finale of Doctor Who. The TARDIS has exploded. The Doctor (Matt Smith) has been imprisoned inside history's most impenetrable prison cell. Amy Pond (Karen Gillan) has been shot dead by her fiancee Rory Williams (Arthur Darvill) - who turns out to be an Auton. Oh, and the universe just ended. Doctor Who's fifth 21st century season ends with a complicated, time-travelling oddly miniscule epic that brings Matt Smith's entire 13-episode debut run to a close. Rewatched almost eight years later, and it feels like one of the most essentially 'Steven Moffat' episodes that Moffat ever devised. For me it also feels as if it has aged remarkably well. Upon its initial broadcast it felt a little too frantic and complex for its own good, with a hand-waved fairy tale ending. Sure, it's still a fairy tale ending, but in an entire season based on the idea that we are all in the end just somebody else's story, it's difficult to imagine a more perfect conclusion than this. Doctor Who has historically used time travel as a magic door: it's simply been a means of the Doctor to get to a new adventure. With his Season 3 episode "Blink" Steven Moffat made time travel a core aspect of the story, and in Season 4 his "Silence in the Library" two-parter played with making the Doctor's future a key component of winning in his present. "The Big Bang" doesn't simply use time travel to inform the story; it uses it to derive the nuts-and-bolts plot. With the Doctor jumping back and forth along his own timeline, it breaks a lot of narrative rules and turns what might have been desperate end-times drama into a genuinely amusing sort of screwball comedy. The time-travelling shenanigans enable the episode to criss-cross the entire 13 episode length of the season, pulling into a unified shape that had never been achieved before. As showrunner, Russell T Davies had included vague foreshadowing code-words - "Bad Wolf" in one season, "Mr Saxon" in another, but as his replacement Moffat takes things to an entirely separate level. The young Amelia Pond of "The Eleventh Hour" returns in a manner that book-ends the entire year. An apparent continuity error from "Flesh and Stone" turns out to be a deliberate and heart-breaking bit of foreshadowing. And then the Doctor dies saving the universe. It's not a fake-out, and while he does obvious get returned to existence out of Amy's memory in a beautifully staged climax, Moffat really does manage to have his cake and eat it too. 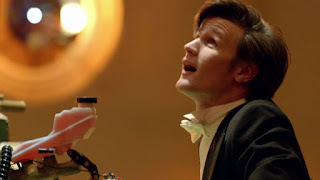 It's a beautiful farewell, and wonderfully performed by Matt Smith. When he comes back, it's such a wonderful moment that it doesn't feel as inevitable as it obviously was. "The Big Bang" is bold, impressively plotted and highly original television. It was not the season finale I ever expected. It turned out to be much, much stranger - and overwhelmingly better. Season 5 wraps up with 12 great episodes out of 13 (damn you, "Victory of the Daleks") and a quality ratio of 92 per cent. This remains one of my all-time favourite seasons of Doctor Who.